So. As much as I adore retellings, I recently realized I'd never actually read an Alice in Wonderland retelling. And what with the absolute rash of them inundating the publishing world these days, I figured it was high time. I've always loved the original classic and the Disney film, but I've never seen any of the more recent film adaptations. When Ace contacted me about reviewing Christina Henry's Alice in anticipation of the sequel's release, it felt like the perfect entry point. Funnily enough, I actually read the first book in Henry's Black Wings urban fantasy series ages ago. We didn't particularly hit it off, but I found myself massively intrigued to find out what she might do with a grown-up Alice. Also, the cover. It sends chills down my spine every time I glance over at the copy sitting on my nightstand. Having now read the words behind that cover, I can verify that the chills only increase after you make the acquaintance of Henry's White Rabbit. Alice is mad. Or so they said when they found her stumbling back out of the Old City, having escaped an unnamed horror, with blood running everywhere and the Rabbit's name on her lips. And so they locked her up for ten years in a asylum for those who had taken leave of their senses, who the New City was too impatient to deal with. But two years in, someone whispers through the mouse hole in her cell. Someone by the name of Hatcher, who never takes the powders the orderlies bring, who fights tooth and nail to avoid the regular baths every inmate must take, who awoke years ago surrounded by bodies with a bloody ax in his hands. And so the two become friends and allies, working desperately to keep a shred of sanity in a world they no longer recognize. Hatcher is determined that one day the opportunity for escape will arise. And when it does in the form of a fire, he and Alice fight their way out of the prison that formed every fiber of their beings for so many years. But now they are on the run. Working their way deep into the twisted streets of Old City, they find themselves on a mad mission to escape the evil the fire released from the asylum and to recapture enough of Alice's memories to know who to hunt and who to flee. If she moved her head all the way up against the wall and tilted it to the left she could just see the edge of the moon through the bars. Just a silver sliver, almost close enough to eat. A sliver of cheese, a sliver of cake, a cup of tea to be polite. Someone had given her a cup of tea once, someone with blue-green eyes and long ears. Funny how she couldn't remember his face, though. All that part was hazy, her memory of him wrapped in smoke but for the eyes and ears. And the ears were long and furry. These opening lines sealed the deal, I'm afraid. There was no going back after I met Alice and she met Hatcher and the two of them agreed to hold hands throughout their ordeal. I was completely unable and completely uninterested in not being with them. Which is saying quite a lot, because their ordeal is not for the faint of heart. I repeat, beyond this point there be dragons of the deepest and darkest kind. I want to make this point early, because this book will not be for many readers. The violence factor is high. 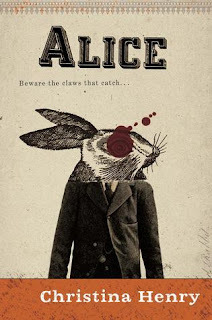 Hatcher is an actual ax murderer, after all, and he has set his sights on keeping Alice safe from any threat, which means the body count is astoundingly high in this dark fantasy that takes all the unhinged zaniness from Lewis Carroll's classic tale and neatly amplifies it by one hundred percent. Essentially, this book and I had no business falling as madly in love as we did. But there you have it. I loved it beyond reason. I kept waiting for the level of horror to send me packing, but the core—the light that Alice and Hatcher make by the mere fact of their survival—kept me following. Their fight to stop the mindless violence of the Jabberwock, their run ins with each of the unspeakably evil crime lords that run Old City, and the slow and terrifying awakening of Alice's memories are all excellently rendered. My one issue with the novel is the absolute preponderance of violence directed toward women. It is omnipresent in Henry's world and it is massively disturbing. Alice is essentially its only survivor, and I think she is meant to be the seed that grows a revolution. Which I am clearly fine with, as I stuck with her through the entire bloody gauntlet. But I want to be sure to say that while I comprehend the reasons behind the dark world Ms. Henry has created, I feel that the story's integrity could have withstood a toning down of the violence against women (particularly during their sojourns with the Caterpillar and the Walrus) and still retained its spine-unhinging terror. That said, this novel is utterly magnetic. Reading it feels like a madcap sprint to the finish. I swallowed it in 100-page chunks and came back each night just eager to slip back into this nightmare world. And the reason why is the two main characters. Alice and her mad Hatcher. Their heartbreaking connection and the furious way in which they cling to it is everything I look for when I come to a tale. I loved their story in all its brutal, broken beauty. I sense they will never be far from my thoughts from now on. "You remember it all now," Hatcher said, and it wasn't a question. "Yes," she said. She was beyond weeping for the child she once was. "It is, more or less, what you would expect. Except for the part where I escaped. Nobody expected that." And now for the giveaway! To celebrate today's release of Red Queen, Ace has graciously offered up a brand new paperback copy of Alice to one lucky reader. This giveaway is open to U.S. addresses only and will run through Tuesday, July 19th. To enter, simply fill out the Rafflecopter. Good luck, and happy reading!